All types of aluminum, galvanized, galvalume and copper metal roof panels including Standing Seam, 5V-Crimp, Ribbed, Snap-Lock and Corrugated profiles. Everything you need for all the metal details of your roofing project. Including Metal Roof Sealants, Drip Edge, Flashing, Scuppers, Goose Necks, Bull Nose, Fasteners and more. Have any metal panels or accessories Customized exactly the way you want. Custom Scuppers, Vents, Chimney Caps, Coping Caps, Radius Profiles and more. When you think of metal roofs, you may think of warehouses, barns and sheds. Nowadays, many homeowners are considering metal roofing for their houses. What’s the main reason? Because metal roofs last much longer than asphalt shingles. A shingle roof may need to be replaced in 7-10 years, while a metal roof could last decades. Many companies have 50-year warranties on metal roofs. While both asphalt and metal roofing have their pros and cons, more and more homeowners are turning to metal roofs. Replacing a roof is costly and inconvenient, and homeowners don’t want to deal with the headache in another 10 years, so they choose metal. In the past 15 years, the share of metal roofing has tripled from 4 percent to 12 percent. This growth is expected to continue as more homeowners discover the benefits of metal roofing, especially in areas that experience inclement weather, such as Florida. There are many types of metal roofing panels, designs and colors to choose from. There are also numerous textures and shapes to give your roof a unique look. Count on metal roofing company in Miami, FL to help you understand your options when it comes to metal roofs for your home or business. Depending on how long you plan to live in your current home, a metal roof may be a sound investment. Metal roofs can last 50 years or longer—typically as long as the house itself. This means that once you buy a metal roof, you will likely never have to worry about your roof ever again. However, if you don’t plan to stay in your current home too long, then it may be better to stick with a shingle roof. Metal roofs can cost three times as much as shingle roofs, and it can take several years to realize the money-saving benefits. Metal roofing is also lightweight and fire-resistant, which is good for Florida residents, since the state sees many fires due to lightning strikes. The materials are not combustible and have a Class A rating, meaning they are the most resistant to fire. The metal is also beneficial for Florida’s hot and sunny weather. Metal roofs reflect heat, so the inside of the home doesn’t get too hot during the day. Installation of metal roofing is also quick and easy. Instead of smaller shingles, you get panels that range from 12 to 36 inches wide, making installation much quicker. Metal roofing is ideal for areas that see a lot of rain and snow. While Florida doesn’t get much snow, it is known for tropical storms. The metal panels help shed water from the roof easily. Metal roofing offers many advantages for residential and commercial projects. To learn more about using metal roofing for your building, contact the Miami metal roofing company at Metal Master Shop. Metal Master Shop is a metal roofing company in Miami, FL that serves as a one-stop shop for metal roofing needs in South Florida. We sell all types of aluminum, galvanized, galvalume and copper metal roof panels including mechanical seam, standing seam, ribbed, 5V-crimp, Snap-Lock and corrugated profiles. If you just need roofing accessories, we can help you with that as well. Metal Master Shop carries a variety of metal roofing accessories to fit every need. We carry accessories such as elbows, goosenecks, overflow scuppers, pipe boots, zipper boots, all purpose vents and caulking. When it comes to metal roofs, proper installation is key. That’s why we carry everything you need to make your project a success. We know that metal roofs offer many benefits, but only when they are installed the right way. We carry high-quality materials and have roofing experience of our own to help guide you so you can avoid leaks and damage caused by improper installation. If we don’t have what you need in stock, or you can’t find it on our website, don’t worry; we can make it for you. We specialize in custom orders. Using the latest sheet metal equipment, we can fabricate roof edging, flashing, accessories, coping caps, scuppers, finials and all profiles of architectural metals. Whether you need something in a special size, shape or color, we can help you achieve your desired look. If you can draw it, we can make it! We provide panel cutting at your job site, with the ability to produce panels of any length – only from your high-caliber Miami metal roofing company. No matter the job, we provide only the best material. Each piece is built to last. We’ll make sure your metal roof is the strongest roof for your home, and possibly the last roof you will ever need. Metal Master Shop can help you with metal roof projects you may have in Mexico, Latin America and the Caribbean. We can ship you everything you need for a professionally installed metal Roofing System with our export services. We ship 5V-Crimp metal panels as well as standing seam metal roof panels in aluminum, copper, galvalume and rheinzink. We can also export all the metal roofing accessories you’ll need, including screws, clips and metal roof underlayment. Throughout the process, you will have access to our technical support team as well as architectural support for drawings, take-off and precise measurements. Exporting metal roof materials from Metal Master Shop is an easy three-step process. Contact us today to get started. Metal roofs may soon become law in parts of Florida. After Hurricane Irma hit Florida, it was found that the homes with metal roofs fared better than the homes with shingle roofs. Therefore, a proposed ordinance could make metal roofs a law. Insurance coverage would be required to upgrade from a shingle roof to a metal roof. Metal roofs are a good idea for Florida residents. They are durable and offer protection against Florida’s sunny, hot and stormy weather conditions.They are also energy efficient, making them good for the environment and your wallet. If this law passes, you’ll want to have a roof from the best metal roofing company in Miami. At the Metal Master Shop, we stand by the quality of everything we sell. All products are in full compliance with the Miami-Dade County building code. As local professionals, we understand the unique challenges of installing metal roofing in Miami. Our roofing panels are highly durable and specifically designed to withstand the wide variations in weather conditions experienced in South Florida. You’ll get peace of mind knowing that your roof will protect your home against hurricanes, tropical storms, intense heat and anything else the Florida climate throws your way. 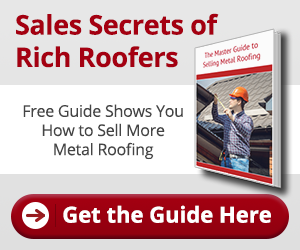 Do you need help with your next metal roofing project in Florida? Contact the Miami metal roofing company at Metal Master Shop. We are proud to be South Florida’s only full-service roofing supply company. We offer complete roofing kits and accessories to fit your needs. We also serve Mexico, Latin America and the Caribbean, so we can assist you with exporting our materials for international orders. We have everything you need to install a high-quality roof. We’re more than happy to provide you with the guidance you need so you can achieve your desired results. Let us help you complete your Miami metal roofing project on time and within budget. Give us a call at (305) 261-9290 or fill out our online form to obtain a free quote.